The bull has entered the China shop. While US President Donald Trump’s preoccupation with what he sees as unfair trade agreements and practices was a staple of his campaign for office, few expected him to pursue those concerns with the vigor and vitriol now on display. After the recent G-7 summit, where Trump found himself roundly isolated by US allies for his tough stance on steel and aluminum tariffs, as well as other trade issues, the very future of the rules-based trade order that the US was instrumental in creating after the Second World War seems in question. 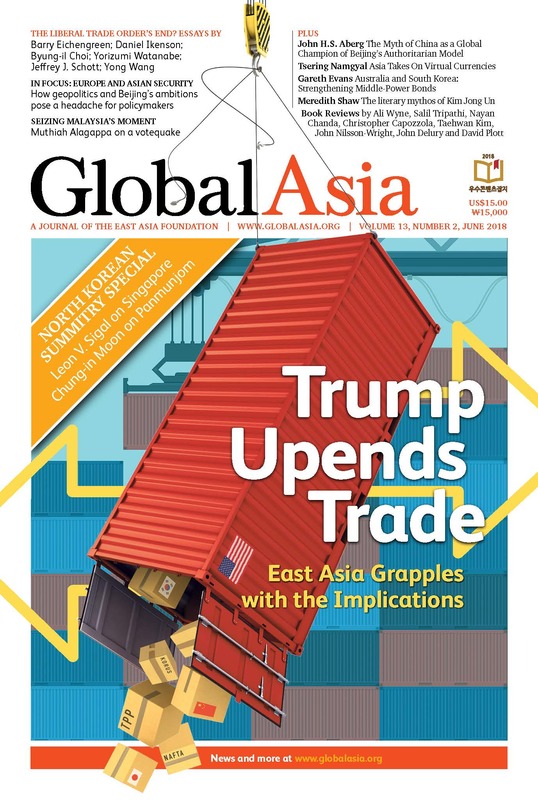 In our cover package, we examine how Northeast Asia’s major nations are grappling with challenges posed by Trump’s unorthodox approach to trade. China figures prominently, as it runs by far the largest trade surplus with the US. As predicted in these pages last year, Trump is proving a “transactional president,” seeking with Beijing to cobble together a package of concessions not aimed at adhering to any broad, multilateral framework, but rather to extract benefits that will hasten a narrowing of the US trade deficit. Beijing is thus faced with unwelcome pressure to address US concerns without appearing to surrender China’s growing influence on the debate about global rules and norms, including those involving trade. Japan is also grappling with Trump’s new bilateral approach, fending off calls to negotiate a US-Japan free-trade agreement and US threats of steep tariffs on Japanese auto imports. For many in Tokyo, the struggle with Trump’s demands harks back to the 1980s and early 1990s, when the US sought voluntary import restraints that, in effect, violated the prevailing global trade rules. But Tokyo is also pushing ahead in its new leadership role in the revamped Trans-Pacific Partnership(TTP) trade accord, from which Trump withdrew the US in his first week in office, and hoping eventually to persuade the US to rejoin. South Korea, for its part, has already succeeded in cutting a deal with the US after Washington demanded a renegotiation of the Korea-US Free Trade Agreement (KORUS). Seoul’s example could prove instructive in how to handle Trump’s transactional and bilateral approach to trade. Elsewhere in this issue, our Features section looks at the historic North Korea-South Korea summit in April and Trump-Kim summit in Singapore in June; why the argument that China presents a new, alternative authoritarian model for the world is a myth; what Malaysia needs to do, now that it has ousted the party that ruled it for 60 years; the challenges of regulating cryptocurrencies in Asia; the importance of Australia-South Korea relations; and what fiction-writing in North Korea reveals about Kim Jong Un and his rule. Our In Focus section takes an in-depth look at the renewed role for Europe in Asian security in the face of the growing US -China rivalry for influence in the region. Europe’s relevance to security issues in Asia receded after the end of the Cold War, but new opportunities for European engagement are now emerging. In addition, we feature an expanded book review section in this issue, focusing as always on some of the most engaging works on Asia. Asia’s mighty trading giants, which have for years benefited from the seemingly inexhaustible US appetite for their exports, have now run headlong into US President Donald Trump’s fierce insistence that the terms of America’s trade with them has been fundamentally unfair. That clash, which could yet lead to trade wars, could upend the global order that has prevailed for decades. Is It the End of the Liberal Trading Order — or a Recasting? The risks posed by Trump’s policies — and ways that America’s Asian trading partners might weather the storm. The president’s approach is based on a misguided understanding of how world trade works and risks hurting the US itself. How the renegotiation of the US-Korea free-trade deal has left so many in South Korea uncertain about Trump’s approach to trade — and US allies. Japan doesn’t want a bilateral US trade deal. Do Trans-Pacific Partnership talks hold an answer? The continuing commitment of the 11 TPP members remaining after the US pulled out could have profound implications for Asia and the world trade order. Beijing and Washington appear to be managing trade tensions, but the risks of Trump’s ‘America First’ policy remain. Arranged Marriage No. 3: Can Trump and Kim Work It Out Despite Past Failures? The US president’s bold decision to meet North Korea’s leader could transform Northeast Asian and global security. The summit gave wings to frayed efforts to denuclearize North Korea, but the challenges ahead remain fraught. Growing fears that China under President Xi Jinping is set to make gains as a global champion of Beijing’s brand of authoritarianism are misplaced. With the downfall of the ruling party after 60 years, the new government under Mahathir Mohamad can turn Malaysia into a beacon of democratic hope in Southeast Asia. Asia has a particular fascination with these virtual currencies, and that has governments grappling with how to regulate them. As China’s influence grows and US leadership is fraught with uncertainty, co-operation on global and regional challenges is more needed than ever. State-approved propaganda tales tell of his strategic prowess, achievements and place at historic events he likely did not attend. Europe is being pulled into a debate on how best to re-engage Asian security issues without risking relations with Beijing. EU policy-makers pay too little heed to the need for new strategic thinking. As Beijing’s will to be a leading seapower changes geopolitics in Asia, Europe is ill-prepared to step up. The Third Revolution: Xi Jinping and the New Chinese State, by Elizabeth C. Economy. Resurgent Indonesia: From Crisis to Confidence, by Vasuki Shastry. Asian Waters: The Struggle Over the South China Sea and the Strategy of Chinese Expansion, by Humphrey Hawksley. President Duterte: How and Why? A Duterte Reader: Critical Essays on Rodrigo Duterte’s Early Presidency, by Nicole Curato (ed. ); The Rise of Duterte: A Populist Revolt against Elite Democracy, by Richard Javad Heydarian.